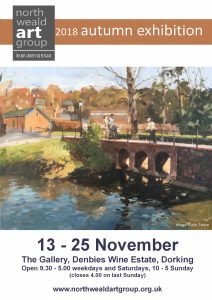 The North Weald Art Group is a society of amateur and professional artists, based in Reigate, Surrey. The aim of the Society is to foster the art of painting and drawing, by bringing together local artists working in a variety of media – watercolour, oils, acrylics, mixed media, collage, pastel – to learn from and inspire each other. The society is over 50 years old and has up to 100 members, mostly living in Reigate and the surrounding area. The society holds a major exhibition each year, in the autumn, and around 120 paintings are on display. We meet locally on the last Monday of the month at 7.45pm when we have demonstrations by professional artists. We also hold occasional workshops and life-drawing sessions, and during the summer we meet at outdoor locations to paint or draw, occasionally with a costumed model. The Annual David Wright Memorial Day sees us meet to paint or draw in locations further afield.